There are many moving parts in any greenhouse, and learning the ins and outs of cooling systems or how you can ventilate your greenhouse naturally will help you keep those systems in good working order. Presented here are things A.J. Both of the Department of Environmental Sciences at Rutgers University says to keep in mind when setting up your cooling and ventilation systems. At the top of the list when looking for a cooling system, Both says to pay close attention to how the system was built. “A grower should note how well things are put together and what kind of components are used. You can buy higher-quality items that last longer and are built to more stringent specifications, or you can buy cheaper materials that may not perform as well and won’t last as long,” he explains. He recommends galvanized materials over sheet metal because they can better withstand moisture conditions in a greenhouse, and tend to last longer. Most of the pricier items come with a manufacturer’s warranty, he adds, which is important to keep in mind. “If you get a warranty or an extended warranty, you know that the manufacturer has spent time thinking about the issues and likely came up with a high-quality product,” he says. Proper maintenance is key to keeping your equipment operating as long as possible. Maintenance includes regular lubrication, examining fan belts and motors, cleaning fan blades, and frequently checking to see whether specific parts need to be replaced. Both estimates that most pieces of cooling equipment should last between five and 10 years, depending on maintenance. “Looking at what the manufacturer recommends is important, and following those recommendations will probably extend the life of the equipment,” he says. One of the two primary types of evaporative cooling systems uses a pad and fans, and this is the less expensive option, Both says. 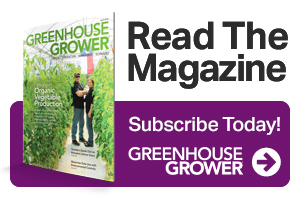 “It’s very effective, but it’s typically installed in the air inlet side of the greenhouse, and as a result you get a temperature gradient as the cooled air moves through the greenhouse and picks up heat,” he explains. The coldest air will be directly on the inside of the cooling pad, and as the air moves throughout the greenhouse toward the fan on the other side, it picks up heat, which results in a temperature gradient throughout the entire greenhouse. This gradient can have an impact on crop growth and development. The other cooling option, a fog system, is more expensive but typically provides more uniform cooling throughout the greenhouse. In this system, small fog nozzles are placed throughout the greenhouse, which creates a more uniform temperature profile. 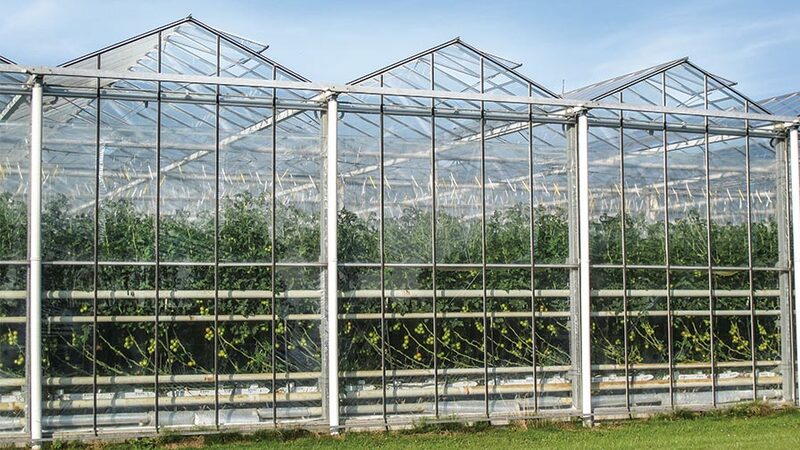 When installing your ventilation fans, Both advises growers to take note of the various resistances to air flow that are associated with the design of the greenhouse. For example, adding an evaporative cooling pad to the inlet opening or adding an insect screen will increase the resistance to airflow. As a result, additional fan capacity is needed to overcome these resistances. In addition, wind conditions outside may generate small air pressure differences between the windward and leeward side of the structure that can interfere with the ventilation system. A properly designed ventilation system will take this into consideration and result in the installation of sufficient ventilation capacity. “This is a critical issue that growers and designers have to keep in mind. They have to match whatever resistances they think the system will impose on the fans and make sure that the selected fans are able to pull sufficient air through the greenhouse to make sure there is enough ventilation capacity,” Both explains. Natural ventilation doesn’t require fans to pull or push air through the greenhouse, and instead relies on strategically located openings to create airflow. Examples include a combination of sidewall openings and roof-ridge openings, or roof openings alone as in the Venlo-type greenhouses. “Natural ventilation relies on two physical principles; the first one is what we call thermal buoyancy or the stack effect. Warm air is less dense and therefore rises to the top of the greenhouse, and if you put an opening there, that warm air will escape and new and colder air will be let in through another roof opening or a sidewall vent,” Both says. Secondly, you can rely on the wind effect, which creates air movement as a result of small air pressure differences on the outside of the greenhouse. “On the windward side, air blown against the structure creates excess pressure. On the leeward side, air is sucked away from the greenhouse and it generates reduced air pressure. By opening up windows that are strategically located in the structure, we can generate an airstream that moves air from the high-pressure side to the low-pressure side,” he explains. The disadvantage to natural ventilation, Both says, is you must rely on outside conditions, so there is not as much control as with mechanical ventilation systems, but because natural ventilation costs less, it can be a good option for growers on a budget. For the most part, crops can successfully be grown using either natural ventilation or a system using mechanical fans, Both says. However, taller and denser crops such as tomatoes and peppers may require additional adjustments to create optimal airflow. Some of the common mistakes Both sees with greenhouse cooling and ventilation systems are miscalculating air flow capacity, not properly sealing unintended cracks or openings in the greenhouse cover, and clogged fog nozzles in the fogging system or supply lines in the pad and fan system. “As with any piece of equipment, it requires attention to detail and making sure that the components are serviced regularly and in good working order when they are needed,” he says. Lauren Alexander is a contributing editor for American Vegetable Grower, a Meister Media Worldwide publication. See all author stories here.